Or Yehuda, Israel, November 19, 2017 – Formula Systems (1985) Ltd. (NASDAQ: FORTY), a global information technology holding company engaged, through its subsidiaries and affiliates, in providing software consulting services and computer-based business solutions and developing proprietary software products, today announced its results for the third quarter ended September 30, 2017, in accordance with International Financial Reporting Standards (IFRS). Consolidated revenues for the third quarter increased by 22.3% to a record-breaking $348.6 million, compared to $285.1 million in the same period last year. Consolidated operating income for the third quarter, decreased by 4.3% to $22.5 million, compared to $23.5 million in the same period last year. The decrease in operating income is attributable to Sapiens’ operating income decreasing from $6.8 million in the third quarter of 2016 to $3.2 million in the third quarter of 2017 (when measured in accordance with IFRS) due to amortization of intangible assets following the acquisition of StoneRiver earlier this year and the implementation of a restructuring and cost reduction plan following the halt of a software development project with a significant customer of Sapiens. The restructuring and cost reduction plan included: de-emphasis of non-core activities in APAC and efficiency measures post the halted development project and the integration of StoneRiver. The cost savings primarily included headcount reductions as well as other cost saving measures. Sapiens expects restructuring and cost reduction expenses of up to $5 million for the full year 2017. Excluding the negative impact of Sapiens’ results, Formula's operating income increased 15.8% year over year. Consolidated net income attributable to Formula’s shareholders for the third quarter was $5.4 million, or $0.36 per fully diluted share, compared to $5.7 million, or $0. 38 per fully diluted share, in the same period last year. 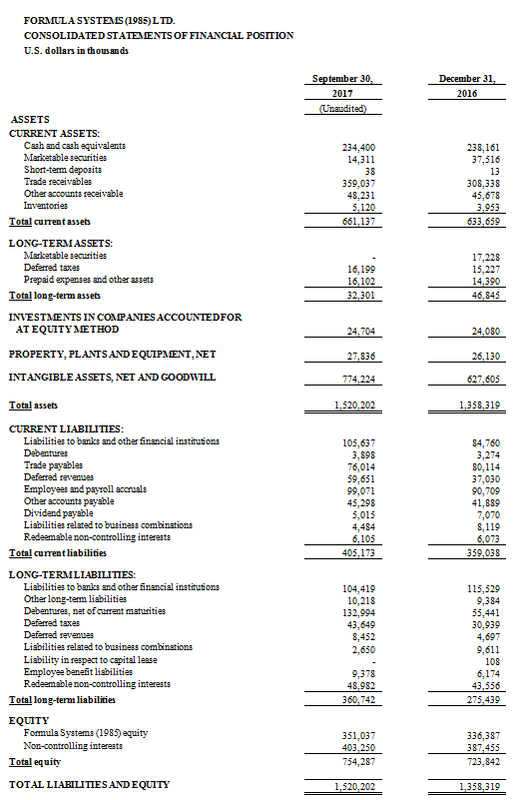 The decrease in net income attributable to Formula’s shareholders is mainly attributable to a decrease in Sapiens’ net income from $5.5 million in the third quarter of 2016 to $1.6 million in the third quarter of 2017 (as detailed above) offset by devaluation of long term liabilities to banks and others denominated in New Israeli Shekels, following the erosion of the New Israeli Shekel against the US dollar amounting to $0.4 million compared to an appreciation of long term liabilities to banks and others denominated in New Israeli Shekels amounting to $1.2 million recorded in the same period last year. Excluding the negative impact of Sapiens’ results and the positive impact of the devaluation of Formula’s long term liabilities to banks and others denominated in New Israeli Shekels, Formula net income increased by approximately 2% year over year. Consolidated revenues for the nine-month period ended September 30, 2017 increased 22.6% to $988.6 million, compared to $806.3 million in the same period last year. Consolidated operating income for the nine-month period ended September 30, 2017 decreased 18.3% to $53.6 million, compared to $65.6 million in the same period last year. The decrease in operating income is attributable to Sapiens’ operating income decreasing from $19.5 million recorded in the nine-month period ending September 30, 2016 to an operating loss of $0.2 million recorded in the nine-month period ending September 30, 2017 (when measured in accordance with IFRS) due to the integration of StoneRiver and the implementation of a restructuring and cost reduction plan (as detailed above). Excluding the negative impact of Sapiens’ results, Formula operating income for the nine-month period ended September 30, 2017 increased approximately 16.7% year over year. 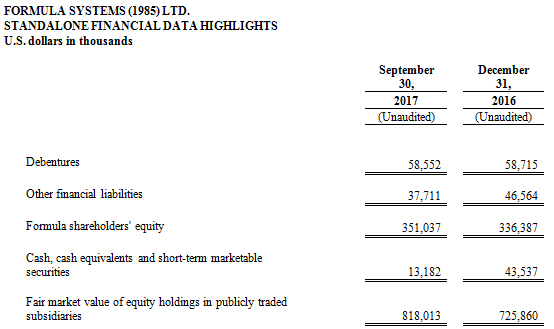 Consolidated net income attributable to Formula’s shareholders for the nine-month period ended September 30, 2017 was $5.6 million, or $0.37 per fully diluted share, compared to $16.5 million, or $1.10 per fully diluted share, in the same period last year. 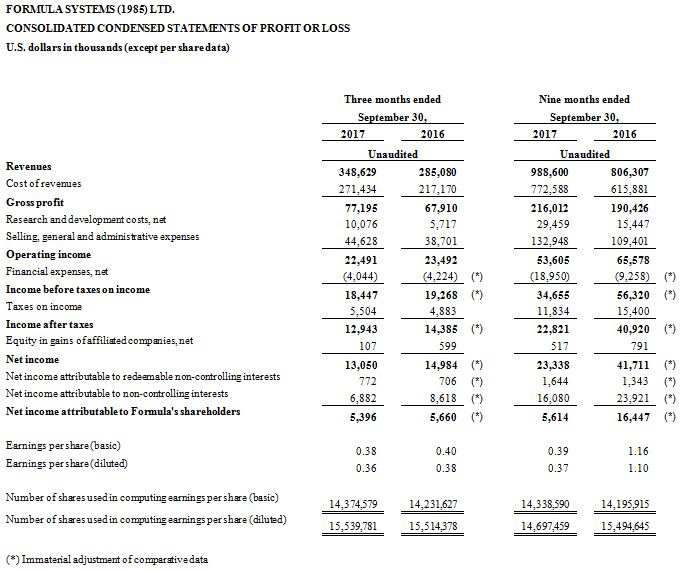 The decrease in net income attributable to Formula’s shareholders is primarily attributable to a decrease in Sapiens’ net income from $15.8 million in the nine-month period ended September 30, 2016 to a loss of $2.9 million in the nine-month period ended September 30, 2017 (as detailed above) and to an appreciation of long term liabilities to banks and others denominated in New Israeli Shekels, following the erosion of the US dollar against the New Israeli Shekel amounting to $5.5 million compared to $1.9 million recorded in the same period last year. Excluding the negative impact of Sapiens’ results and the appreciation of Formula's long term liabilities to banks and others denominated in New Israeli Shekels, Formula net income increased by 17.5% year over year. As of September 30, 2017, Formula held 49.5%, 48.7%, 47.2%, 100%, 50% and 90% of the outstanding ordinary shares of Matrix IT, Sapiens International Corporation N.V, Magic Software Enterprises Ltd., Michpal Micro Computers (1983) Ltd., TSG IT Advanced Systems, and Insync Staffing Solutions, respectively. Consolidated cash, short-term investments in marketable securities and bank deposits totaled approximately $248.7 million as of September 30, 2017. Total consolidated equity as of September 30, 2017, was $754.3 million (representing 50% of the total balance sheet). As of September 30, 2017, Formula was in compliance with all of its financial covenants under the debentures issued by Formula in September 2015 and under loans granted from other financial institutions. “Formula’s third quarter results show solid improvement as evidenced by the group’s strong revenue growth" said Guy Bernstein, CEO of Formula. "Matrix crossed the quarterly revenue mark of $200 million for the first time, and achieved growth across all financial indicators. Matrix reported record-breaking revenues of $203.7 million and $576.4 million in the third quarter and in the first nine months of 2017, reflecting an increase of 13.2% and 12.4% year over year, respectively. Matrix’s financial strength, its position in the market and its thousands of experts with the experience and knowledge at its disposal, enable Matrix to provide its customers with innovative technologies and solutions that address the challenges of the market. Sapiens’ third quarter results demonstrate another quarter of double-digit revenue growth and incremental progress. Sapiens reported record-breaking revenues of $72 million reflecting a year over year increase of 28%, with non-GAAP operating margin improving from 4.7% in the previous quarter to 12.5%. This solid improvement is primarily a result of the successful integration of StoneRiver (Sapiens’ recent acquisition) and the implementation of cost-saving measures enacted following the halt of the development project that Sapiens reported in the first quarter. Sapiens is maintaining its guidance for 2017 full year revenues of $265 to $275 million (on a non-GAAP basis), which is expected to be on the higher end. Sapiens is also maintaining its expectations for full-year operating profit margin between 9-10% (on a non-GAAP basis), which is expected to be on the lower end. Magic continued its double-digit growth momentum through the third quarter and first nine months of 2017 with strong performance in sales and revenues across its products and professional services. It enjoyed revenues of $66 million and non-GAAP operating income of $9.1 million for the third quarter, up 21% and 17% respectively year over year, driven primarily by organic growth. Due to better visibility, Magic narrowed its revenue guidance to between $250 million and $255 million for the full-year 2017, up from their prior guidance of between $245 million and $255 million. Magic’s ever-growing portfolio, including Magic xpc iPaaS Platform, its most recent release, provides both the solutions and services needed by enterprises to succeed in today’s digital marketplace. TSG (held jointly by Formula and Israel Aerospace Industries ("IAI")) together with IAI, were declared winners of Israel’s Ministry of Defense (IMOD) tender as part of the "IDF Network" program for leading the transfer of the IDF’s computers infrastructure (currently operating in dozens of locations) to centralized, advanced data centers and will consolidate dozens of computer centers, currently scattered across the country, and establish modern computer centers. Six leading Israeli and international technology groups competed in the tender. The scope of the project is estimated at hundreds of millions of shekels over the next decade. This win is the largest technological tender in the history of the IDF and the IMOD. We are excited about Michpal’s market opportunity following the release of a new product and a new service line – "Michpal Pension" and "Michpal PensionPlus”. These solutions enable all employers to digitally report their employees’ pension fund payments to their respective pension funds as required by law. (This requirement takes effect on February 1, 2018 for employers who employ more than 21 employees and on February 1, 2019 for employers with no more than 20 employees)”. Formula Systems (1985) Ltd. is a global information technology company engaged, through its subsidiaries and affiliates, in providing software consulting services and computer-based business solutions and developing proprietary software products.